This song can be found in my latest book: I Sing To You: 100 Finnish Folk Songs and Tunes with Sing-able English Lyrics. The version in this book is a simple arrangement that includes the melody line, lyrics and chords. My latest video is a collaboration with Finnish Indie game developer - and musician - Sami Maaranen. His RPG game, UnReal World is strongly inspired by and based on Iron-age Finland and the "Kalevala culture". I play the kantele and Sami plays drums in this song, which is the opening song of the game. If you're interested, you can download a free copy of the game at: www.unrealworld.fi. This song, Kalliolle Kukkulalle (On the Clifftop) - which is beautifully animated by Saana Herranen - can be found in my new book: I Sing To You: 100 Finnish Folk Songs and Tunes with Sing-able English Lyrics. Joukahainen loses a singing contest to him, is told in Rune 4 of the Kalevala. I decided to experiment by including a rhythm track with this song, which tells the story of Väinämöinen's Birth. Michael King, a UK luthier, made the beautiful pentatonic kantele I'm playing in this song, which I wrote to express my love for my home in the western mountains of Maine. I've been working on a series of songs inspired by the Kalevala. This song, which I call Sahri Maid comes from Rune 11 and it tells the story of Kyllikki's abduction by Lemminkäinen. I developed my own method of playing kantele because it was hard for me to pluck the strings in the "traditional" way. Some people who've seen me play like my style of plucking, and have adopted -- and adapted -- it to suit themselves. My plucking style gives a clear attack. If you have smooth finger pads that slip off the strings, you will find this style of playing a lot easier. Click on the video to see and hear me play a shortened version of my song, Something Funny, using my thumb plucking style of playing. 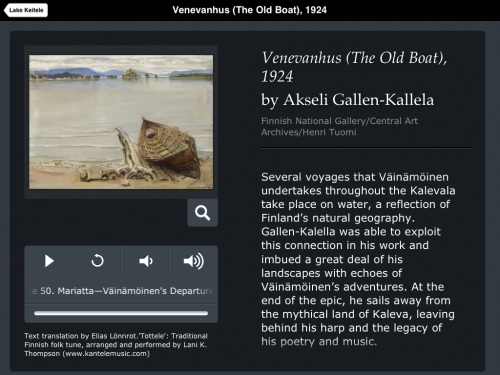 I was honored in the fall of 2012, when the National Galleries of Scotland asked me if they could use my arrangement and recording of the traditional Finnish folk tune "Tottele" as the background to a reading of an extract from The Kalevala, which will be available on a touch screen for people to listen to in relation to a painting by Akseli Gallen-Kallela. A picture of the touch screen presentation is shown above. A link to the audio track can be found here. If you'd like to listen to the music itself, you can hear it here. January 24, 2016: Looking for music for 11 string kanteles? I've got some in the store, along with some traditional Finnish folk songs with sing-able English lyrics. October 21, 2015: My new book, I Sing to You: 100 Finnish Folk Songs and Tunes with Sing-able English (and Finnish) Lyrics has been released. October 3, 2015: Free sheetmusic! Two new songs with sing-able English and Finnish lyrics were posted on the Music/Sheet Music page. These include Vagabond’s Waltz (Kulkurin Valssi) and Great is the Desolation of Your Shore (On Suuri Sun Rantas Autius). August 17, 2015: Coming Soon! I Sing To You: 100 Finnish Folk Songs and Tunes With Sing-able English Lyrics. Email me if you'd like me to contact you when the book is released. June 15, 2015: I've added several new Finnish song lyrics here and included a simple translation for most of the songs on this page. Sept. 10, 2014: My new book, My First Kantele: 21 easy lessons for the absolute beginner was released on August 15th. If you're teaching yourself how to read music, this is the book for you - even if you can't read music. June 3, 2014: My new book, The Handle on the Banana, a collection of 57 songs written for 10 string kanteles, has been released. This book includes childhood favorites, campfire songs and some original music to enjoy with the children in your life. Games and fingerplays are included, as well. March 25, 2014: Interested in learning how to play the kantele? Email me for info regarding private lessons online via Skype.